Governor Macquarie ordered the first signal station in Tasmania, erected on Mount Nelson near Hobart in 1811. Signalling by means of flags reported the arrival of ships in the River Derwent. By 1818, the main signal station at Mulgrave Battery (now Princes Park) was under construction. The moveable arm semaphore was in use in England by 1827 and reached Tasmania in 1829. The original three-arm system, incapable of sending numbers greater than 666, was replaced in 1838 with a six-arm system, with 999,999 possible settings. Codebooks listed up to 3000 different signals. In 1835 signal stations from George Town to Launceston were completed. The system ran on five stations until 1852 when a sixth was added. This system used a combination of flags and wooden semaphores. Primarily used for shipping, it lasted until 1858. The greatest impetus to the semaphore system in the south was the interest of Charles O'Hara Booth. As Military Commander of Port Arthur, he saw the value of a system of rapid communication and established signal stations between Hobart and Port Arthur, which operated from 1836 to 1877. Smaller stations conveyed local messages, with several within the Port Arthur settlement and one at the boys' prison at Point Puer. 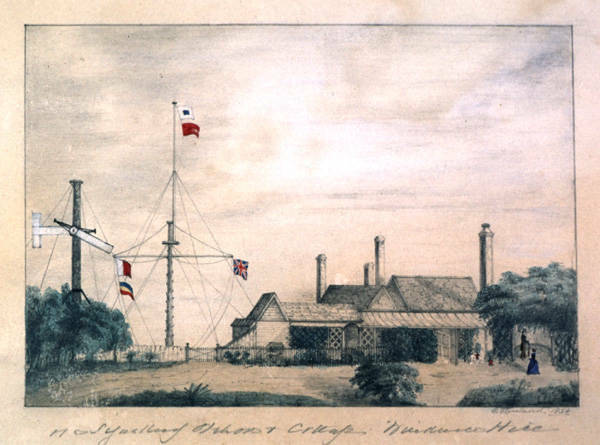 Because the semaphore at Mount Nelson served two different purposes, it was extended to a height of 80 feet, with two sets of three pairs of arms. The upper set was used for communicating with Port Arthur and the lower set conveyed shipping information. A short message from Hobart to Port Arthur and return reply could be completed in approximately fifteen minutes under clear conditions. The closure of the manual semaphore station on Mount Nelson came with the arrival of the telegraph in 1880. Shortly afterward, the final signal, 343, 'forgotten' was sent. Further reading: W Masters, The semaphore telegraph system of Van Diemen's Land, Hobart, 1973.